Earlier today, the Perth Mint of Australia used Twitter to announce a 1 tonne Gold Kangaroo coin. The 1 tonne weight is equal to 1,000 kilograms or 32,150.7466 troy ounces. Based on the current market price of gold, the coin has a value of more than US$55 million based on the gold content alone. 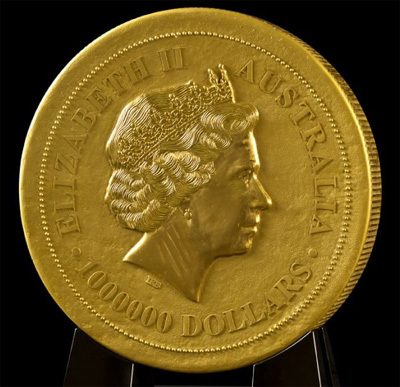 The obverse of the coin features Ian Rank Broadley portrait of Queen Elizabeth II and carries the face value of AU$1,000,000. The reverse design features the classic kangaroo design by Dr. Stuart Devlin AO CMG, goldsmith and jeweller to Queen Elizabeth II. The inscriptions include the “2012” date and “1 Tonne 9999 Gold”. In a separate tweet, the Perth Mint shared the address of a website dedicated to the record breaking coin at 1tonnegoldcoin.com. Previous holders of the title of world’s largest gold coin include a 31 kilogram Gold Philharmonic coin struck by the Austrian Mint in 2004, which carried a €100,000 denomination. This was followed by a 100 kilogram Gold Maple coin struck by the Royal Canadian Mint in 2007, which carried a face value of CA$1,000,000. Wow, what a monster that is. Anyone know where it is going? Perhaps on display in the Perth Mint or a museum? Or are they actually going to try to sell this thing to somebody? Who really want to buy this coins? What good about collecting this 1000 kilogram Gold Kangaroo coins? If you purchased this coin, How can they send it to you? Are you sure Onion News is not represented here…. Don’t touch it! This coin is worth more if it is kept in uncirculated condition.